This new $15M mixed-use development has been conceived as an integral component of the existing vibrant Los Feliz Village café, restaurant and commercial shopping district on Vermont Avenue in Hollywood, California. 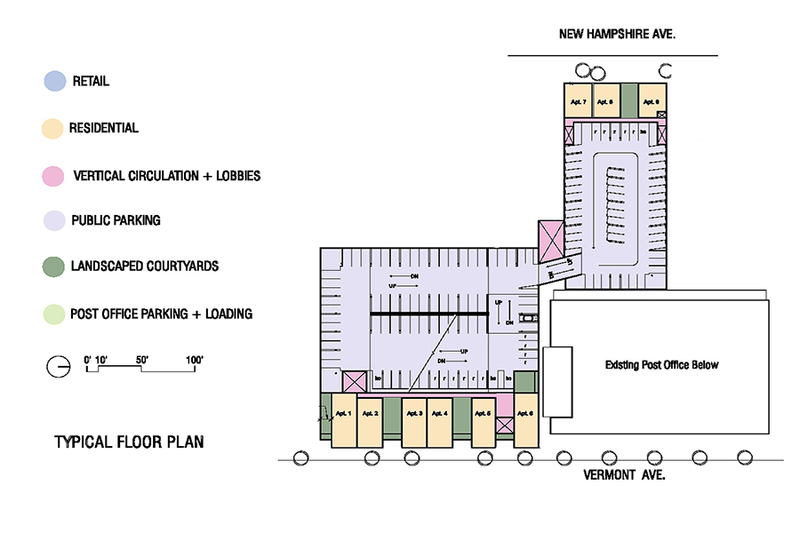 Occupying the current parking lot of the neighborhood Post Office, the project combines 5,000 SF of creative retail space with 36 contemporary LEED housing units. The retail and 24 courtyard apartments open out to Vermont, while 12 additional apartments face the quieter residential area to the west. Parking has been retained for Post Office staff and visitors, and an additional 500 parking stalls have been added to alleviate a chronic shortage of parking in this busy area. Each modern residential unit incorporates daylighting, views and access to private and communal outdoor spaces. The project was sustainably designed with energy-efficient features by Sparano + Mooney Architecture for LEED certification.